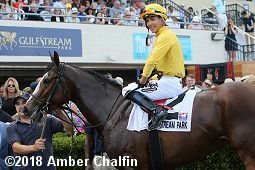 The highlight of the Gulfstream Park meeting for Triple Crown season is the $1.1 million Xpressbet Florida Derby (G1), a major prep for the Kentucky Derby worth 100 points to the winner as part of the Kentucky Derby Championship Series. Conditions were excellent at the Hallandale Beach oval, with sunny skies and temperatures in the mid 80's, with the main track fast and the turf going firm. 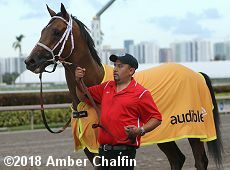 A field of 9 three-year-olds contested this 1 1/8 mile trip on Saturday afternoon with Holy Bull (G2) winner Audible was sent off as the 8-5 favorite. 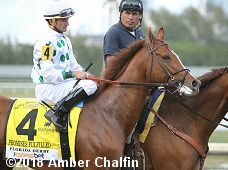 In to challenge him included 5-2 second choice Catholic Boy, 2nd in the Sam F. Davis (G3) after winning the Remsen (G2), and 9-2 third choice Strike Power, winner of the Swale (G3) but 2nd in the Fountain of Youth (G2). 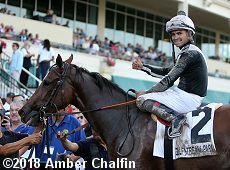 Jockey Robby Albarado sent 7-1 Promises Fulfilled to the lead first time by through fractions of 21.95, 46.37, and 1:11.68 while pressed by Strike Power and stalked by 10-1 Mississippi. On the far turn Promises Fulfilled and Strike Power tired as Audible, 5th early under John Velazquez, moved out 4 wide to sweep to the front through 1 mile in 1:36.96. Kept to task by Velazquez, Audible drew off to win by 3 lengths over late-running 8-1 Hofburg in 1:49.48. It was a long 7 3/4 lengths back to Mississippi third. Left: Audible in the winners circle. 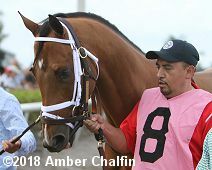 Winning trainer Todd Pletcher said, "The race unfolded with the pace that we were hoping for and we wanted to get some position into the first turn, which he was able to do beautifully. Just watching the race I was a little concerned at the 5/8 pole because he started to drop back a little bit, but I could tell Johnny wasn't panicked. He kind of grabbed him up and sometime midway down the backstretch he started to pick up horses and I started to feel better and better. You could tell the pace up front had developed pretty swiftly so you felt like those horses were going to start to come back at some stage." Right: Audible heads back to the barn. Left: Audible heads to the paddock before the race. Winning jockey John Velazquez said, "I had to use my horse to get position on the first turn. I was in the spot I wanted to be in going into the backstretch and after that I was pretty happy. The only thing that concerned me was when he got to the backstretch he started backing up a little bit. I thought I was overdoing it so I had to give him a little chance on the backstretch to regroup again and once he got his stride back together and when he started moving again on the backstretch I was very happy with the way he was doing it." Right: Audible in the post parade. Velazquez added, "Once he got to the horses on the lead I just tried to keep him busy down the lane and he kicked pretty good. I didn't ride him last time but he way he ran today he was definitely impressive. The distance didn't seem to bother him at all. I think the farther he goes the better he gets. 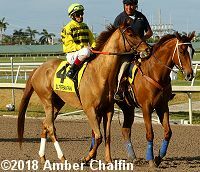 I used him a little too much going into the first turn but by the time I got to the backstretch I had to give him a little break where he got to be comfortable again and then he started rolling." Left: Second place finisher Hofburg in the post pardae. 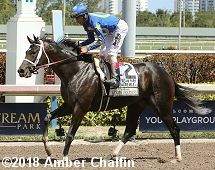 Trainer Bill Mott said, "Naturally, winning would have been the only thing that would have been better but he ran well and he galloped out well. He took ak lot of dirt and he was very professionial. He did everything right. He was much more seasoned today when he came down here and was in the post parade and everything. He seemed to be more at home." 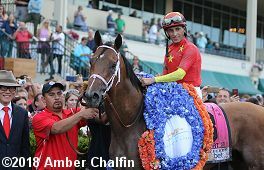 Jockey Jose Ortiz added, "Perfect trip, he did it like a champ. He proved a lot today and got beat by a good horse. I followed Audible the whole way, good trip and he behaved like a champ. 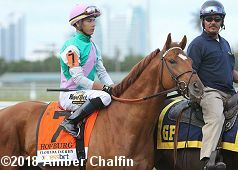 I'm really happy with how he's progressing, I think he's a really nice horse." Right: Third place finisher Mississippi heads to the paddock before the race. 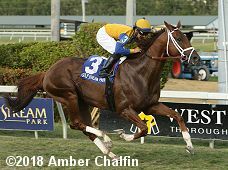 Nick Tomlinson-Alleyne, assistant to trainer Mark Casse said, "We were really happy with the way he was coming into this race and he ran well. 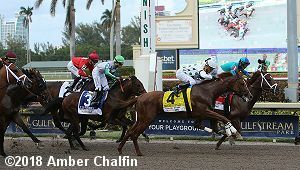 It was tough catching Audible and Todd Pletcher in a race like this, but our horse gave it a good try." 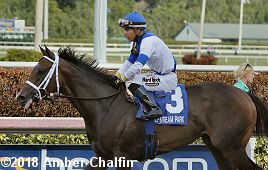 Jockey Julien Leparoux added, "I had a good trip. He broke sharp. They went very quick up front, but from my point of view I could drop into the first turn and he was traveling very good. At the half-mile pole he was loaded and he ran his race." 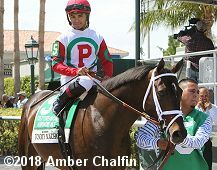 Robby Albarado aboard pacesetter and last place finisher Promises Fulfilled (4) said, "It's crazy because our strategy has been documented and publicized, that we're going to the front at all costs. Luis Saez (Strike Power) knew I was going to the front and those were my exact instructions, but going 21, 46 was just too much pressure early on and both finished galloping out together. We could have gone 24 and 48 and it still would have just been the two of us on the backside, so I don't understand the logic there, but he came back good. I took care of him." 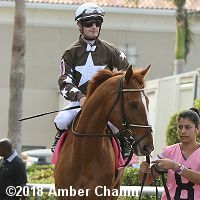 The distaff counterpart to the Florida Derby is the $300,000 Gulfstream Park Oaks (G2) at 1 1/16 miles, worth 100 points to the winner as part of the Kentucky Oaks Championship Series. 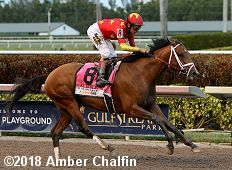 Forward Gal (G3) winner Take Charge Paula was the 5-2 favorite in the field of 11 off her second place finish in the Davona Dale (G2). 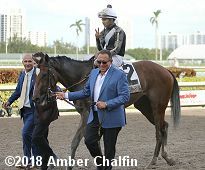 In to challenge her included 11-4 second choice Coach Rocks, a maiden winner last out, and 7-2 third choice Princess Warrior, 4th in the Herecomesthebride (G3). 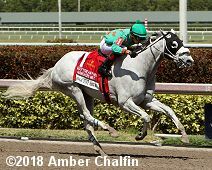 Take Charge Paula and 25-1 Alter Moon dueled for the lead through fractions of 23.47, 47.27, and 1:12.22 while stalked by 85-1 Eight Thirtyone and 7-1 Cache. Entering the lane Take Charge Paula opened up a 2 length lead through 1 mile in 1:37.89, but Coach Rocks, 7th early under Luis Saez, came out wide for room and rallied to win going away by 1 1/2 lengths in 1:44.63. It was a long 10 lengths back to Princess Warrior third. Left: Coach Rocks in the winner's circle. Winning trainer Dale Romans said, "She figured the game out. I never expected her to lose. Every time I've brought her over, I thought she would win. It took time for her to figure it out that she is as good as she is. When she swung out wide and finding her rhythm, I thought she would grind them down. I know she's fit and distance wasn't an issue." Right: Owner Roddy Valente leads Coach Rocks to the winner's circle. Winning jockey Luis Saez said, "What a rough trip. My plan was to break and be right up front, first or second, but there was a lot of speed in the race. Thankfully when we got to the 3/8 pole, it got clear and she took off. When we came to the stretch I thought the horse to beat was going to go, but my filly kicked fine and thank God we passed them." Left: Second place finisher and beaten favorite Take Charge Paula returns after the race. Right: Third place finisher Princess Warrior in the post parade. 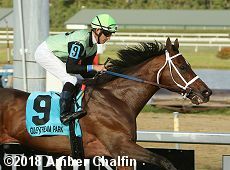 The first of 5 graded stakes on Saturday was the $300,000 Gulfstream Park Hardacre Mile (G2) for older horses going 1 mile on the main track. 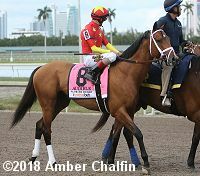 Hal's Hope (G3) third place finisher Irish War Cry was the 7-4 favorite in the field of 6 over 9-5 Always Dreaming, last year's Kentucky Derby (G1) winner but unraced since 9th in the Travers (G1), and 5-2 Tommy Macho, wnner ofthe Fred Hooper Stakes (G3). Jockey Jose Batista sent 12-1 Conquest Big E to the lead exiting the chute through fractions of 23.57, 45.88, and 1:10.03 while pressed by Always Dreaming and stalked by 22-1 Mr. Jordan. Entering the stretch Conquest Big E opened up a 4 length lead through 7f in 1:22.65. Kept to task by Batista, Conquest Big E cruised to a 3 length win in 1:35.92. It was another 1 1/2 lengths back to Tommy Macho third, while favorite Irish War Cry was 4th early, failed to rally, and was eased late by Jose Ortiz finishing last. 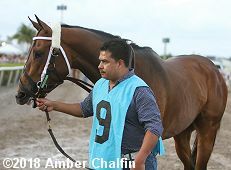 Winning trainer Donna Green Hurtak said, "He's been having a little bit of a bad habit of hopping out of the gate, and it's costing him a good position which has cost him in the other two stakes races that he ran in. We did a little gate work with him, trying to get him out of the habit, and it's great when you're a trainer and things work, because it's not easy to get them out of bad habits. I'm very proud of him today." 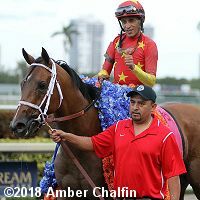 Jockey Jose Batista added, "I just wanted to make sure I had a good break, relax the horse and we went on and the horse responded, which made it easy," It was the first graded stakes win for trainer and jockey. Left: Second place finisher Always Dreaming returns after the race. Trainer Todd Pletcher said, "I thought he ran well first time off a layoff. 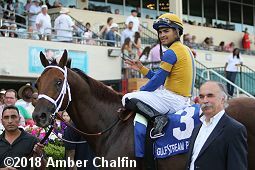 Gulfstream can be a tricky track when a horse gets loose like that. We got the trip we were hoping for. I thought he fell into a good rhythm and ran steadily. The horse on the lead never came back. It was a positive effort. A mile is a tough distance to start off a layoff. We gave a way a lot of recency to pretty much the whole field." Right: Third place finisher Tommy Macho heads out for the post parade. 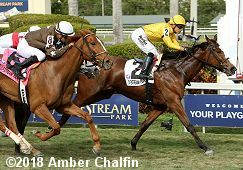 A field of 9 older fillies and mares contested the $250,000 Honey Fox Stakes (G3) at 1 mile on turf. 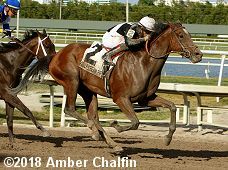 My Charmer (G3) winner On Leave was sent off as the 2-1 favorite over 3-1 Stormy Victoria, winner of the South Beach Stakes, and 7-2 Lull, unraced since 5th in the Matriarch (G1) in November. 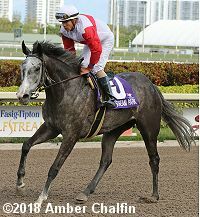 Jockey Jose Ortiz sent Lull to the lead first time by through fractions of 22.44, 45.06, and 1:08.56 while pressed by 8-1 Team of Teams and stalked by 47-1 Conquest Hardcandy. Turning for home, Lull opened up a 2 1/2 length lead through 7f in 1:20.50. 15-1 Res Ipsa, last early, put in a strong late rally but Lull held her off late to win by a nose in 1:33.14. It was another 1/2 length back to favorite On Leave third. Winning trainer Christophe Clement said, "Jose is a great rider, that's why he rides so much for us. We were a touch worried because it was her first time back, but we knew she was big enough to win. She's top class, 6, 7 furlongs, a mile is probably her best. She's a wonderful filly to be around. Belmont day is definitely on our radar for her." 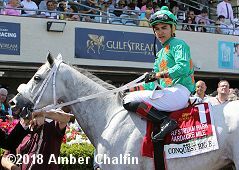 Jockey Jose Ortiz added, "Christophe told me she has speed and just not to take a big hold and if she wants to be there [on the lead], let her be there. We were expecting softer fractions than that, but she was going fast but very relaxed. That was important in getting home." Left: Second place finisher Res Ipsa heads out to the track before the race. Right: Third place finisher and beaten favorite On Leave returns after the race. Immediately before the Florida Derby, a field of 9 older horses went 1 1/2 miles on the turf in the $250,000 Pan American Stakes (G2). 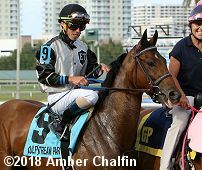 Mac Diarmida (G2) winner Sadler's Joy was sent off as the 9-5 favorite over 5-2 Hi Happy, 3rd in the Gulfstream Park Turf (G1), and 4-1 Bigger Picture, winner of the John B. Connally Turf Cup(G3). Jockey Chris Landeros sent 9-1 One Go All Go to the lead through fractions of 23.96, 49.21, 1:13.79, and 1:38.15 while pressd by Hi Happy and stalked by 23-1 Markitoff. Around the far turn for the last time, jockey Luis Saez sent Hi Happy to lead through 10f in 2:00.91. Kept to task by Saez, Hi Happy drew off late to win by 2 3/4 length over One Go One Go in 2:28.85. It was another 1/2 length back to 22-1 Classic Covey third, and 1 1/2more to favorite Sadler's Joy fourth. Winning trainer Todd Pletcher said, "We felt that he ran well at a mile and an eighth last time and today we felt with that race under his belt, he would perform." Jockey Luis Saez added, "[One Go All Go] was the speed of the race. Everything went perfect. We sat second. At the half-mile pole I asked my horse and he kept battling. When we made the straight, he just took off." Left: Second place finisher One Go One Go leads first time by. Right: Third place finisher Classic Covey in the post parade in the post parade.